Take I-95 Exit 6 in Wilmington, Delaware (Maryland Avenue) and turn right onto West Street. Follow the signs to Barclay’s Building. From our hand-tossed Signature Salad to our Tomato, Basil, and Mozzarella Sandwich served on delicious warm flatbread, to the comfortable, urbane and contemporary atmosphere – Così is simply good taste. A place where all elements combine to stimulate the senses and create a lasting impression. ‘Fabulous’! exclaimed Ruth Reichl of the New York Times…’Hot Concept’ said the Nation’s Restaurant News. In just a few short years Così has garnered national attention and collected many ‘best of’ awards from the communities we serve. At the center of Così is our hearth, an open-flame stone oven prominently displayed in each restaurant, reminiscent of a comfortable gathering place where people have met for centuries to enjoy good food and conversation. Our signature flatbread is based on a two millennia-old recipe, similar to the breads first produced by the Romans. 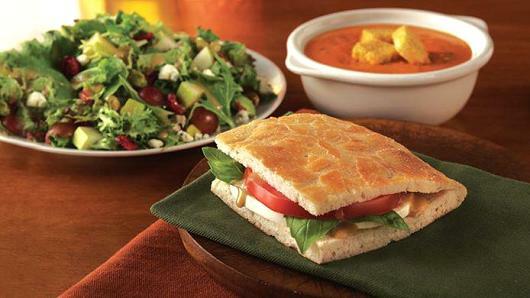 Così’s sandwiches are made to order with fresh and flavorful ingredients nestled in our signature flatbread. But we’re not just about sandwiches. Our distinctive menu offerings also include a wide variety of salads tossed to order, pizzas, soups, bagels, unique gourmet beverages and desserts. Something for everyone to enjoy – any time of day. Our look and feel was first inspired by a small Parisian café – a warm inviting spot where people liked to go for coffee, spend time with the community and of course, enjoy a great sandwich. There is an immediate connection with Così that so many feel when they first walk in the door. You’re surrounded by a sophisticated, modern and warm atmosphere complete with eclectic music inviting you to relax and enjoy an added personal touch from our partners, while savoring the innovative flavors of our menu. Così offers a premium convenience where you always feel welcome.